Tempted by the promise of fame and fortune, the Singing Mermaid joins a circus. The crowds love her, but the poor mermaid is kept in a tank by the wicked circus owner Sam Sly, and she soon longs to return to the freedom of her ocean home. 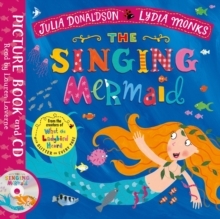 The Singing Mermaid is a delightful tale from the stellar picture book partnership of Julia Donaldson and Lydia Monks, creators of What the Ladybird Heard. With brilliant rhyming verse, bright and distinctive illustrations and glitter on every page, this story is loved by children and parents alike. This paperback and CD edition features a fantastic reading of the story by Lauren Laverne. Enjoy all the stories from Julia Donaldson and Lydia Monks: Sharing a Shell, The Princess and the Wizard, The Rhyming Rabbit, The Singing Mermaid, Sugarlump and the Unicorn, Princess Mirror-Belle and the Dragon Pox, What the Ladybird Heard, What the Ladybird Heard Next and What the Ladybird Heard on Holiday.